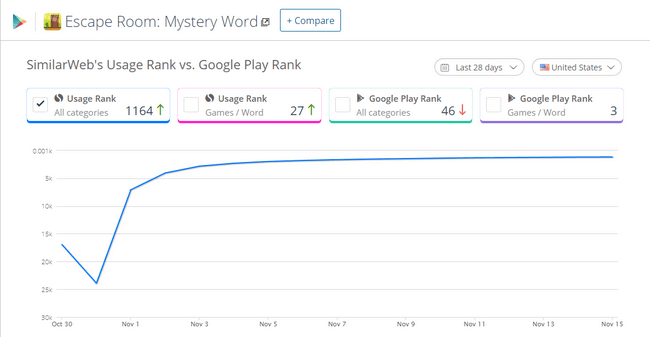 We tested a lot of word games in 2018, many are just a copy for swipe letters concept which was used first by Bitmango in 2016 with Word Cookies, which earned him the “Editor’ Choice” badge on Google Play. Other companies worked really hard to bring up a different concept and only few of them succeeded, in this topic, we will share our experience with the word games which we are very addicted. This ranking is based on Game play, uniqueness and difficulty! 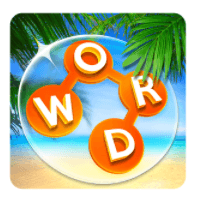 Launched on 2018 October, this wonderful game combine two popular concepts : Escape and Unjumble letters ! what sets it apart from classic games. All words are related to a story: A man in prison who tries day after day to escape, to find a word without a clue or hint is hard in some cases. 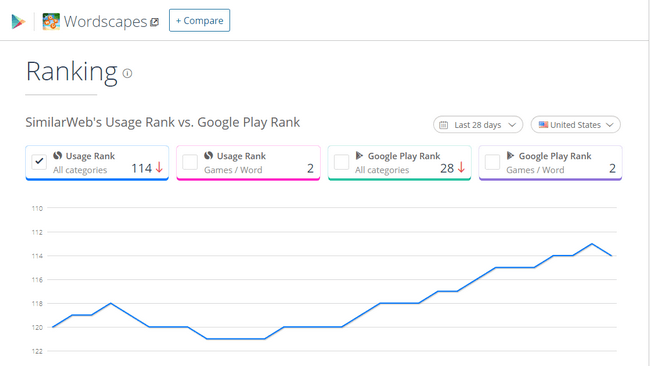 Words Story Usage Rank based on Similar Web stat. 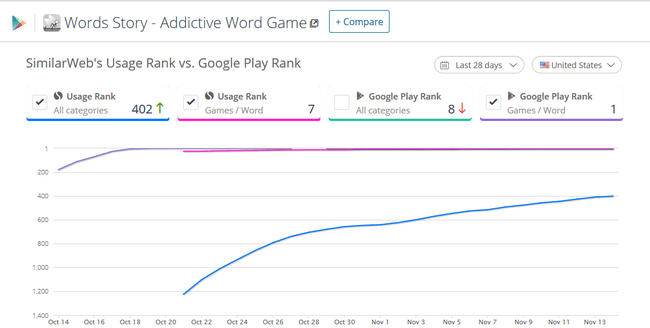 As we can see, words story is ranked first based on Google Play Rank. 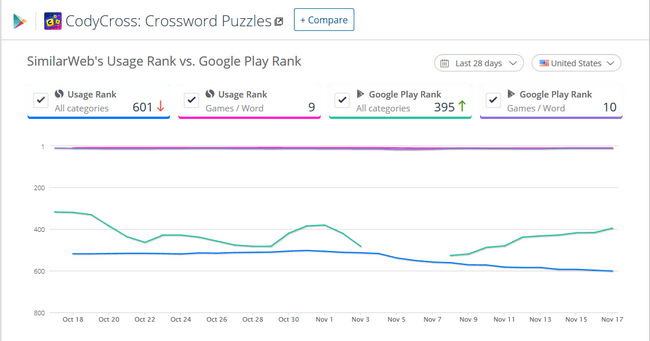 We think that Peoplefun are the leaders in Word Game Category on the Google Play Store with two games on the top 5 ( based on applyzer stat ) and 5 games on the top 50. 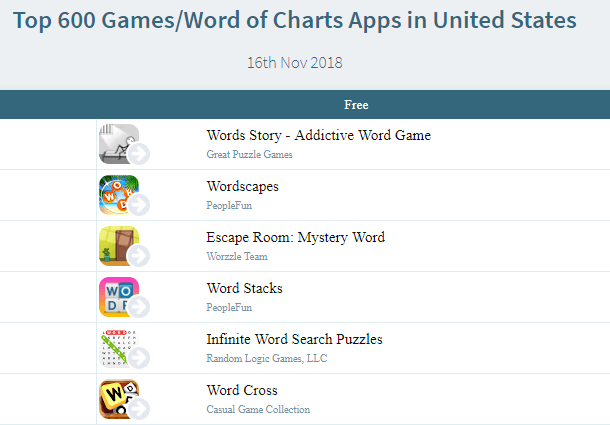 With more than 10 000 000 downloads for Wordscapes, more than 350k reviews above 4.5 stars rating and still on the top 5 games for nearly two years, we think that Wordscapes deserve to be the game of the year for 2018. We will make a dedicated topic for Peoplefun with more details. 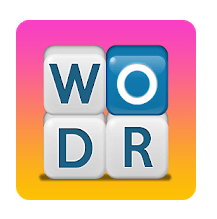 This game is made by the same company who developed Words Story, but in this case, they made a more completed word game with more pictures and hints to help gamers find the hidden words. 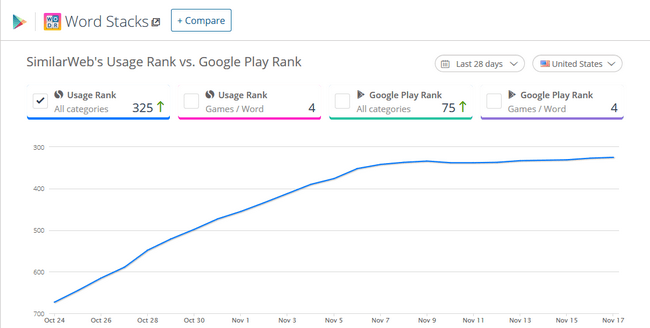 So for this reason this game has quickly reached the third place based on Applyzer stat with more than 1 000 000 downloads. Peoplefun has used an old concept but made his personal touch which pushed the game quickly in the 4 rank, why ? 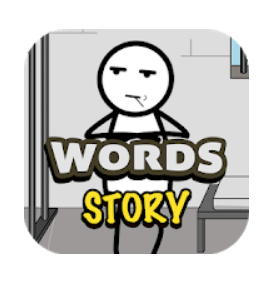 simply because the game play is just wonderful, all words are carefully chosen, each level is truly related to the clue … we feel that they are serious in what they are doing. 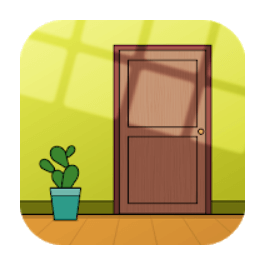 We are really excited to see the next Peoplefun game ! 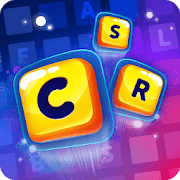 We think that Codycross is the most innovative Word Game that appeared in the last two years, combining crossword and handmade chosen riddles. He deserve to be the Best of 2017 Google Play store .